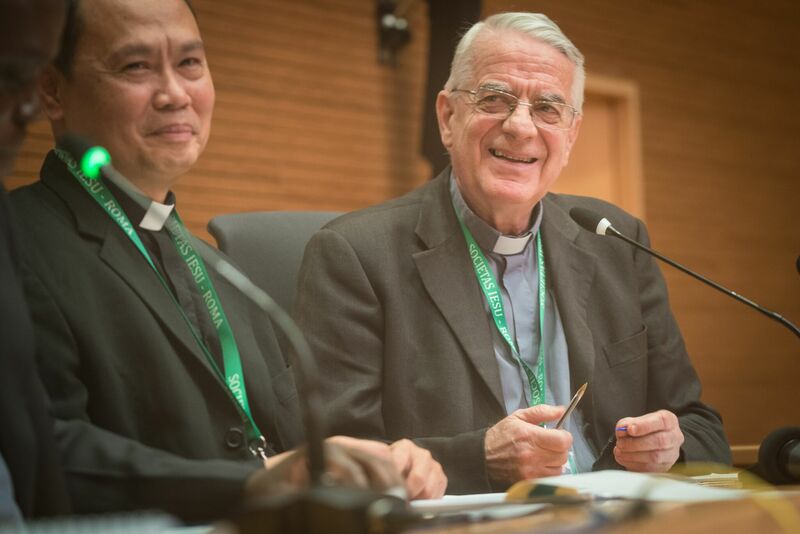 During the morning session on Monday, October 3rd, after the General Congregation had accepted the resignation of Father Nicolás as General of the Society, Father Federico Lombardi, one of the four Assistants ad providentiam, came in front of Congregation to honour the outgoing Superior General. The Assistants ad providentiam, who are elected by the General Congregation, are the closest collaborators of the General. Father Lombardi has accompanied Father Nicolás throughout the years as the head of the Society of Jesus. It was therefore appropriate that he could, on behalf of the collaborators of the former General but also on behalf of the whole Society of Jesus, express his gratitude to Father Adolfo Nicolás. Father Lombardi thanked him first of all for the person he is, for the cordial and spontaneous style that has always characterized him throughout his years of service as General. Fr. Nicolás has favoured simplicity in his relationships with all his fellow Jesuits, something that was even further enhanced by his sense of humour and genuine smile. This assured the Superior General with the affection and confidence of all. More importantly perhaps, the General has inspired the religious commitment of the Jesuits and reminded them throughout his time as the head of the Society of Jesus of the universal perspective of the Jesuit mission, which requires looking beyond the borders of provinces or countries. The emphasis given to the depth in everything, avoiding superficiality, also marked the way Father Nicolás spoke. In the words of Father Lombardi, the leader who just resigned as General gave the example of serene wisdom marked by imagination and coloured by the experience of years in Asia. This prompted the General Curia towards creativity to better serve the Society, giving everyone the chance to be part of a team and live in co-responsibility. Similarly, the General has encouraged a culture of accountability in the exercise of governance. He had to face the demanding challenges that came around; he supported the lives of his companions with letters and interventions always marked by a real sense of listening. The participation and the discreet role of Father Nicolás in the Synod on the Family also deserve mention. More broadly, the General was able to ensure constructive relationships with the Roman Congregations and many other ecclesial bodies, given the need to defend the Jesuits with clarity and justice. Father Lombardi also notes that Father Nicolás was the first General who has been in function during the pontificate of a Jesuit pope, This unprecedented historical situation is something that can still inspire our thoughts, especially our understanding of our service to the Holy Father. All Jesuits give thanks for the support that Father Adolfo Nicolás gave them. They assure him of their prayers; they want the Lord to accompany him in his new commitments. You can access to the whole speech in English, spanish, french or italian (original).